My other guest this weekend, my cousin, Stacy, chose to have me bake her a loaf of Ricotta and Fresh Chive Bread. 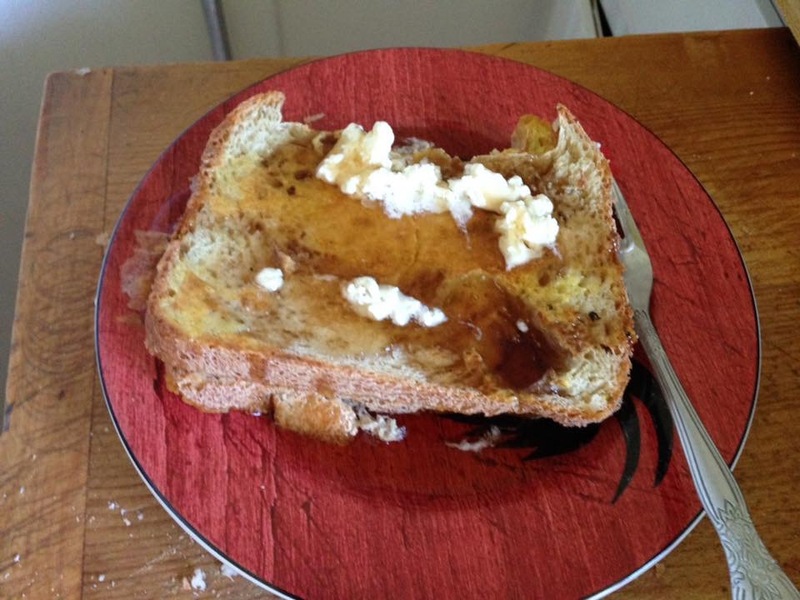 The recipe states that it is a delicately flavored bread that loses its subtle flavor if frozen. As a result, I wanted to wait until the day she will be headed back home to bake this one. That way she can be sure to eat it fresh. 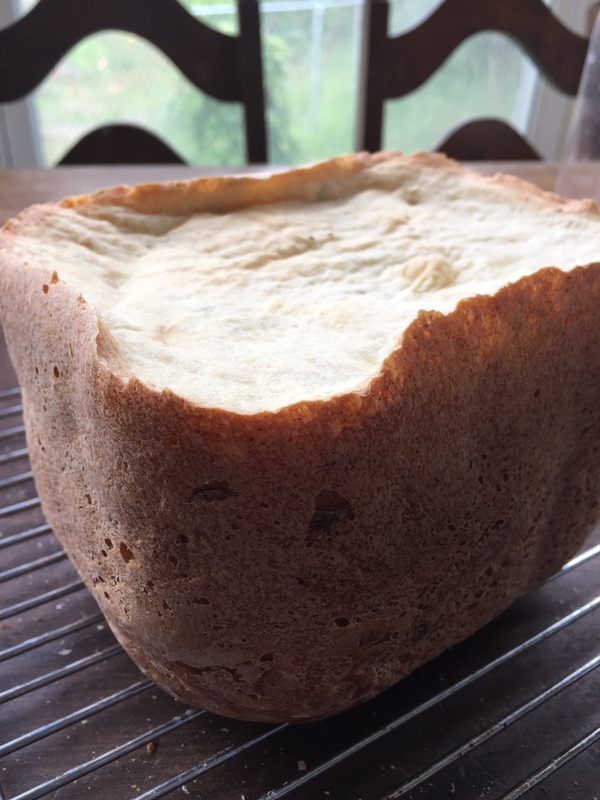 I bought a whole-milk ricotta for this loaf, the cookbooks recipe allows for your choice of whole milk or part-skim. 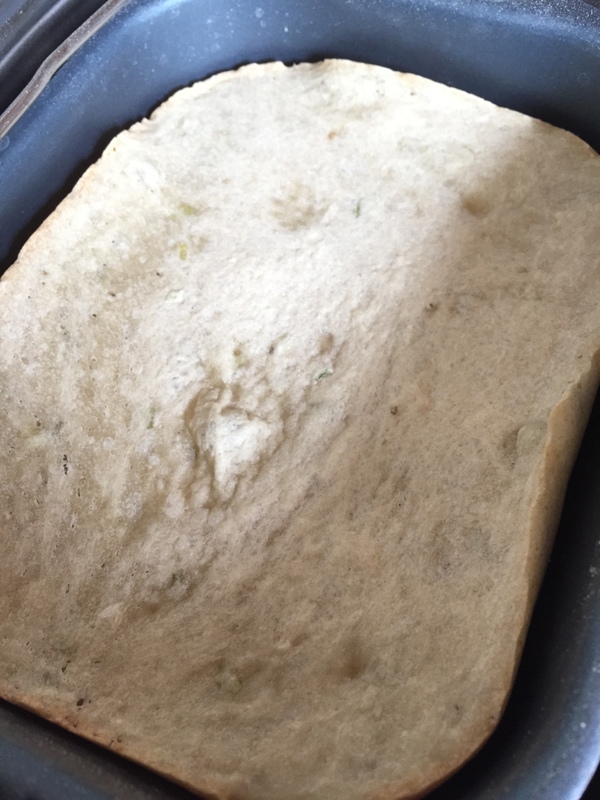 Ingredients for this loaf are 1 cup water, 1/3 cup ricotta, 3 cups bread flour, 1 tablespoon light brown sugar, 1 tablespoon gluten, 1 1/2 teaspoons salt, 1/2 cup chopped fresh chives, Dash of ground black pepper and 2 1/2 teaspoons SAF yeast. As the dough first started mixing, I thought it looked really wet, but I didn’t want to add any more flour. I am glad I waited, because the longer the ingredients had to incorporate, the better the dough began to look. I checked the dough as it was rising and was not encouraged. It didn’t seem to be rising well at all. Not just a crater top, this thing looks like a brick of cheesy, oniony bread. Oh dear, was the dough too wet? Should I have added more flour? It smells incredible, so I won’t toss it. I will just let the cycle continue. This is a wait and see loaf at this point. It finished baking, and never rose well. It is a really pretty, golden brown color and the smell of cheese and chives is really tempting. As I was scratching my head, trying to figure out how this happened, I discovered my error. As I was measuring my ingredients, when it came to the 2 1/2 teaspoons of yeast, I shorted myself and used only 1 1/2 teaspoons. I remember thinking, I will just use the 1/2 teaspoon measuring spoon, repeatedly. I should have used it 5 times, and I only used it 3. Another loaf, another lesson learned. PAY ATTENTION, PAULA! I will add more to this post after Stacy tastes it. I am feeling really guilty about the texture, I am sure it will be really heavy, but she has already talked about having a slice warm with cream cheese, hopefully that will work. Way to think outside the box, Stace! Well at least you found the mistake. It sounds like it would be very tasty so do try it again sometime.